Metro is having a good week on the funding front. The state of California has recommended $1.792 billion — yes, billion — in grants from SB 1, the landmark state transportation funding package that became law in 2017. The funds come from these SB 1 programs: the Transit and Intercity Rail Capital Program (overseen by the California State Transportation Agency), the Local Partnership Program, Solutions for Congested Corridors Program and Trade Corridor Enhancement Program. The California Transportation Commission is scheduled to adopt the funding awards at its meeting on May 16 and 17. 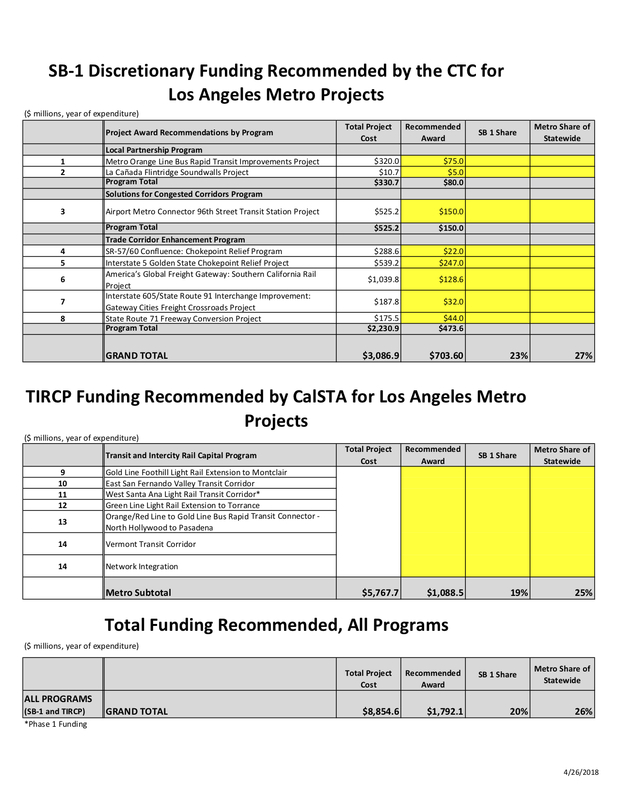 Many of the projects recommended for funding are part of the Measure M Expenditure Plan — as we’ve said before, having local funding helps attract state and federal funding. Los Angeles Metro appreciates the California Transportation Commission and California State Transportation Agency staffs’ consideration of the applications submitted by Metro and our partner agencies in Los Angeles County, and their recommendations for funding. Upon award, Metro will work closely with both the CTC and CalSTA to deliver these projects expeditiously. So just what will Metro do when SB 1 is voted down in November? Will they take all of the gas tax and licence fees that now go to non highway and transit uses and apply them to where they should have been going? No doubt there will be more money available for transit and highway projects than will be coming from SB 1. The problem is what will the other agencies do without the money they have been raiding from the California gas tax and licence fees? This is really good news! Is this a program that will keep funding projects every year? Yes, the state issues grants every or most years through a variety of different programs. Some of these funds will be doled out over several years and it would be a heavy lift for Metro to score this well every year. But it’s still very good news and Senate Bill 1 helps guarantee there will be funds in the state pot going forward.